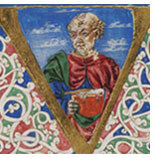 Francesco Petrarca was born on July 20, 1304. Commemorations of the 700th anniversary of his birth are taking place this year (2004), primarily in Italy but also around the world and in the United States. 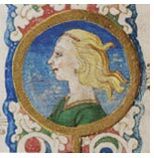 At Yale University, the celebration includes an international conference on Petrarch, September 23 - 25, and an exhibition at the Beinecke Library, as well as this web exhibition. The Beinecke Library is the leading institution in the United States in collecting Petrarch manuscripts (codices or fragments that contain works by or about Francesco Petrarca), from popular copies of the Canzoniere and Trionfi to the lesser-known De remediis utriusque fortune and Nota de Laura, as well as the memoirs and drawings of the English clergyman and literary editor John Mitford (1781-1859). The first Petrarch manuscript to enter the Yale University Library was Marston MS 17, the only copy in the United States of Petrarch’s Itinerary to the Holy Land (Itinerarium breve de Ianua usque ad Ierusalem et Terram Sanctam). 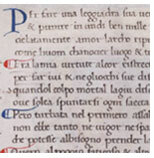 In the 1950s, seven more Petrarch manuscripts were added. Fourteen more were acquired in the 1960s and the collection was moved to the Beinecke Rare Book & Manuscript Library, which opened its doors in 1963. 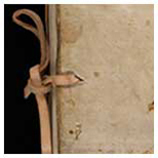 In the last few years, six new Petrarch manuscripts have been acquired by the Beinecke, the last one purchased in 2004. The many and varied facets of Petrarch’s writings, as well as his reception among readers, are well represented in the Beinecke Library. 3. 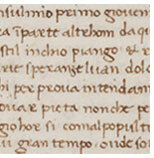 MS 222, Canzoniere, no. 270, 129 .